Big news in the American Bombshell camp. 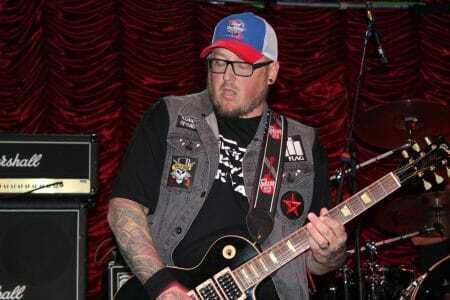 Less than three weeks after releasing their sophomore album Tattooed ‘N Bruised via the EMP Label Group on March 29, 2019, American Bombshell have parted ways with their guitarist Steve Boyles. Boyles gave a small hint on what might have been the issue by later commenting: “… more of the same lol I’m a Rock N Roll guy! Probably more Punk Rock sounding”. American Bombshell‘s debut album No Regrets finished at #6 on the Sleaze Roxx’s Top Ten Albums of 2016. American Bombshell – “Money On The Liquor (Official Video) The first single from the album “Tattooed ‘N Bruised”, available worldwide March 29, 2019.